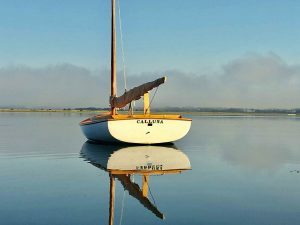 Are you in search of a high quality, handcrafted, traditional built small sailboat to enjoy sailing about the harbor/bay with a sense of pride and pleasure? A boat that the whole family can enjoy, from the grandparents to the grandkids? Then look no further, the 12’-4″ Beetle Cat is the boat to have. It is a boat to dream about, of high quality, flawless construction, embodies the maritime tradition, and makes one proud to own and sail. 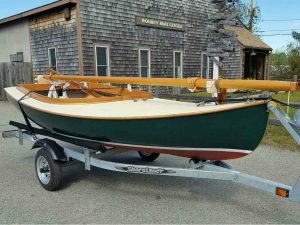 In its 98th year the Beetle Cat sail boat is still handcrafted in the USA. 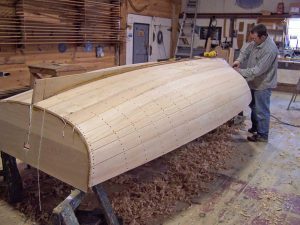 The Beetle Boat Shop is dedicated to crafting quality boats using traditional methods. 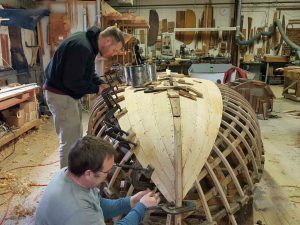 With no straight lines in the construction of a wood boat, building a complicated shape where every joint must have the perfect fit is an art form. Lead by their passion and pride the artisans and craftsmen at the Beetle Boat Shop achieve this end in every Beetle Cat that is produced. 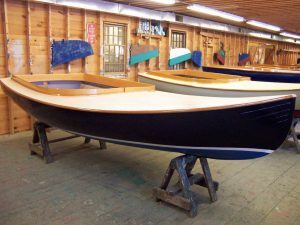 The Beetle Boat Shop is preserving the traditional boat building skills that are unique to only a small number of experts, skills such as: scarfing, fitting planks, riveting, steaming, and set-up and lining off planks. 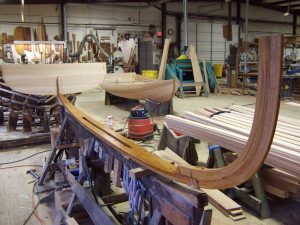 The keel is steamed and laid in a jig for the first step in constructing the boat, which then leads to the assembly of the boat’s backbone. From there the hull receives ribs and planks which complete the shape of the hull. The hull is then expertly faired, and seams caulked with cotton. Mast step, floor timbers, floorboards, and ceiling are added next, followed by deck structure, decking, canvas, coamings and rails. The boat then heads to the paint shop for final paint and varnish, followed by the installation of its bronze hardware. 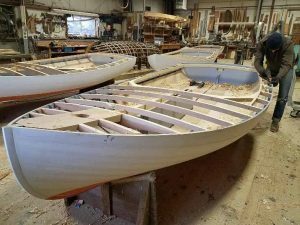 All spars, (mast, boom and gaff) are constructed, varnished, and fit to the hull, along with the rigging, centerboard, rudder, tiller, boom crutch, and sail to complete the boat. This photo says it all, owning a high quality handcrafted Beetle Cat, the pride of the harbor!